(Newser) – John Tortorella says he sees coaching Team USA hockey as helping his country—and he will not tolerate players failing to stand for the anthem. "If any of my players sit on the bench for the national anthem, they will sit there the rest of the game," he tells ESPN's Linda Cohn. Tortorella, who will return to coaching the Columbus Blue Jackets after this year's World Cup, has a son who's an Army Ranger serving in the Middle East, CBS Sports reports. Spoiled rich kids should support this country, or GTFO!!!!!! 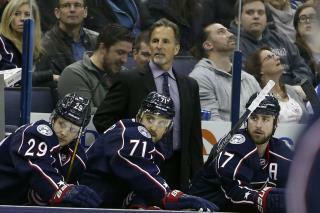 Tortorella says "you vil obey my instructions to forgo your rights as I know more than you". Trumpanzzees adopting the rules of their master.